This one is quite simple (not really a tutorial). A friend got married a few weeks ago and suddenly found herself with 2 dozen 'branch' centerpieces and no idea what to do with them. I offered to take one off her hands and this is how I came to have a Teddy Bear tree! Her wedding was pink and silver with white. 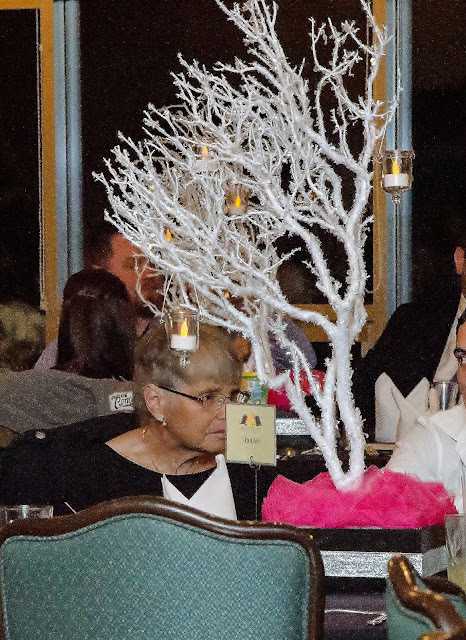 She made the centerpieces from white crystallized branches that looked a bit like they were snow crusted. She added pink tulle, silver ribbon and hanging battery operated tea lights. They were absolutely perfect for the wedding! However, once I got it home....it didn't quite fit with my X-Mas decor. So I changed it. First we switched out the tulle. I bought about 1 1/2 yards of blue at the fabric store. We also picked up 4 blue glittered package style 'flower picks' that were on sale 70% off at Joanns! The tulle was just bunched up and attached with pins so it was simple enough to take the pink off and put the blue on. We added ornaments we had on hand. We started with white 'snowball' ornaments, then added blue feathered ball ornaments. A few teddy bear ornaments were added at the bottom (except for the angel teddy who needed hung so he could 'fly') The package picks got placed in each corner and we finished off with glittery ball ornaments that matched the colors already in use. How cute is this? Of course this type of thing could be adapted to any color scheme. We could have changed out the silver ribbon also, but it fit with the color scheme so we left it. DD was so happy with it she wanted to keep it in her room. She's also been talking about changing it after Xmas so that she can keep it up year round. *sigh* Kids!